Since we are the manufacturer, we have the ability to custom build any length hose assembly, using any of the hose and fittings we offer. If you don’t see what you need to fit your requirements feel free to contact us. Nissan 240SX 1989-1999 Clutch Conversion. This is a complete OEM replacement kit from the slave cylinder to the master cylinder replacing both the hard line and flex lines. All of our clutch lines are single lines made of stainless steel braided hose with a PVC outer covering, and a variety of hose ends, includes bolts and washers. Kits for other applications are available. Our complete high pressure OEM replacement power steering assembly for a Nissan 240SX, made with our -6 stainless steel fittings and PTFE stainless steel braided hose covered in black hytrel protective covering for no extra charge! Includes all necessary fittings. Lines for other applications are available. 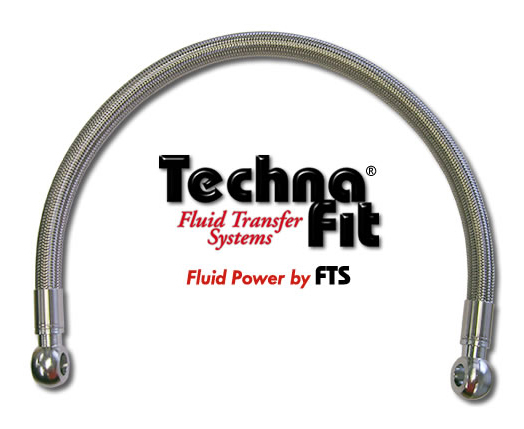 Techna-Fit's hoses are made with Hyperline FX, a smoothbore convoluted PTFE hose. FX has extreme flexibility, great flow rates, and the ability to withstand high temperatures, a perfect fit for the Mazda Rx-7 engine. These hoses will outlast and out perform the OEM hoses 10 to 1, due to a larger I.D. (.652 inches) you will get less restriction and better flow. Made with steel metric fittings manufactured to the same sizes as the OEM fittings. Fits both, turbo and non-turbo, bolts & fittings sold separately. With our new 15,000 sq foot facility, located in Brownsburg Indiana, we now have the ability carry a larger and more diverse inventory with a better production workflow, and room to grow! 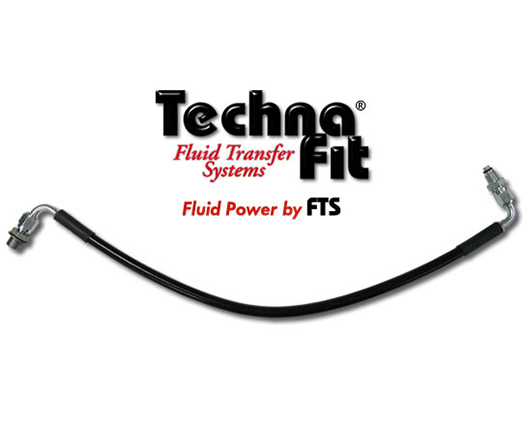 Operating from an ISO 9001:2015 Certified and DOT Certified assembly facility in Brownsburg, Indiana, Techna-Fit® FTS has, over the past two decades, become a leading brake line manufacturer with customers worldwide. Whether you're looking for top-quality stainless steel brake line kits or performance hoses and fittings, you'll find we produce the very best available. This includes a huge selection of fluid transfer systems for automotive vehicles, motorcycles and ATVs for both auto enthusiasts as well as professional car racing teams. If you require a top-line brake line kit or made-to-order custom brake lines, you've come to the source that can satisfy your brake line needs. We currently supply most of the online stores, as well as sell directly to our many customers. You'll find we carry automotive hoses for power steering and turbo chargers as well as fittings and hoses for commercial hydraulic use. We're also happy to provide you with unique, custom-designed applications that most of our competitors are unable to provide. 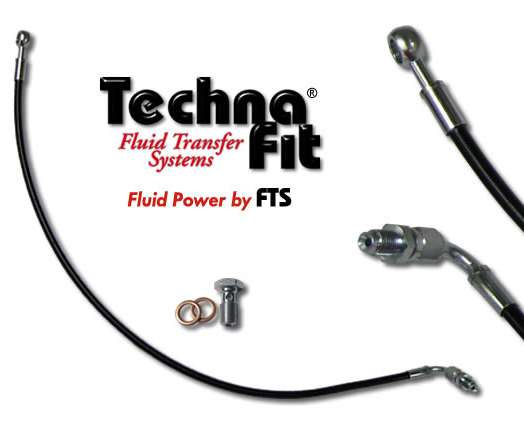 Techna-Fit prides ourselves on having unbeatable quality and pricing, outstanding service, and fast delivery. We guarantee it! Don't settle for less than the best.